This paper explores Max Weber’s intellectual relationship to the first generations of the Austrian School. Challenging his portrayal as a one-sided historicist, the paper reconstructs Weber’s intense involvement with the Viennese economists from the 1890s to his passing in 1920 and his efforts to overcome the fronts left behind by the Methodenstreit. Section 2 discusses a number of necessary conditions for declaring a scholarly community a “school”. Section 3 systematizes the multiple biographical connections, especially Weber’s nexus to Friedrich von Wieser and Joseph Schumpeter. Section 4 focuses on the research program of Social Economics during the first decades of the twentieth century as the “irenic formula” for the post-Methodenstreit hostilities. Within Social Economics, economic sociology constitutes an “intermediary” layer between economic theory and economic history, addressing the institutional properties of the framework surrounding the processes of human action and exchange. 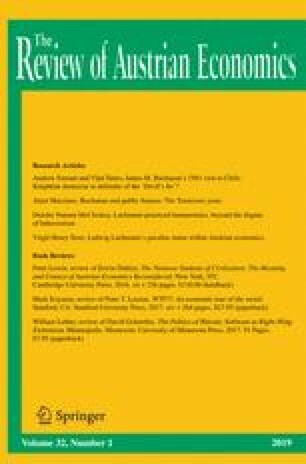 Depending on the relative importance and qualifying power of economic sociology vis-à-vis economic theory, the paper distinguishes two varieties of Social Economics, a “universalist” and an “institutionalist” one. The author thanks Peter Boettke and the participants of the Austrian School of Economics Workshop at the Wirth Institute for Austrian and Central European Studies, University of Alberta, October 11-14, 2018. Adrian Riess (Walter Eucken Institut, Freiburg) was also very helpful in identifying and retrieving the numerous references to Friedrich von Wieser in the Max Weber Complete Edition.